David Shields is a University of Washington professor of English and author of 15 books, including the New York Times best-sellers “The Thing About Life is That One Day You’ll Be Dead,” and “Salinger,” which was co-authored with Shane Salerno. His next book is a debate with former UW student Caleb Powell titled, “I Think You’re Totally Wrong: A Quarrel.” Actor and director James Franco is making a movie based on the book that is currently filming in Lake Arrowhead, Calif., about two hours outside of Los Angeles. Shields answered a few questions about the experience for UW Today. Q: What’s this film about and how did it come to happen? A: The film is a debate about life and art between me and my former student Caleb Powell (UW ’91). Caleb always wanted to become an artist, but he overcommitted to life; he’s a stay-at-home dad to three young girls. I always wanted to become a human being, but I’ve overcommitted to art. The book is being published by Knopf in Sept 2014. James Franco, who has been my student the last several years in the Warren Wilson low-residency MFA program, read the book and wanted to make a movie out of it. 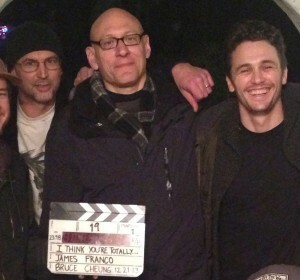 The film is premiering at Sundance in January 2015. Q: What do you mean, you “always wanted to become a human being”? A: It’s a joke. It’s meant to suggest that I’m so committed to art that I’ve become something of an android. As my wife says, I have no hobbies. In the book and film I’m forced to confront this abyss. Q: Have you ever done any acting? A: Teaching is acting. Writing is acting. Living is acting. Other than that, no. Q: What is James Franco like to work with in such a situation? A: James created a very relaxed atmosphere for me and Caleb, who aren’t actors. At crucial moments, James pushed us very hard to explore incredibly difficult and fraught emotional territory. I’ve never felt more powerfully the force of James’s intelligence. Q: Is there a script for your discussion – for the film? A: Caleb and I wrote a treatment, a script, a scene sheet, and a beat sheet, but we wound up throwing all of that out when a real-life argument overtook the script. James urged us to explore that, we did, and in effect that became the film: At what price art? But this time for once with real-life consequences. Q: How do you go about “playing yourself” in a film acting situation? A: Caleb and I have what he calls a “natural reverse dynamic.” We can’t be together for 30 seconds without arguing. I was so eager to defeat Caleb in the argument that I was all but oblivious of the cameras. Caleb seemed to feel the same way. Q: What are your hopes for this book and movie? What do you want to address with this filmed debate?